2) What is the planet whose orbit brings it closest to that of Earth? 3) What causes the solar eclipse to happen? 4) Which is the planet that is farthest from the Sun? ​5) What causes the lunar eclipse to happen? 7) Name the planet that is closest to the Sun. 8) Name the two astronomers who were the first to set their foot on Moon. 9) How many natural satellites are there for our Earth? 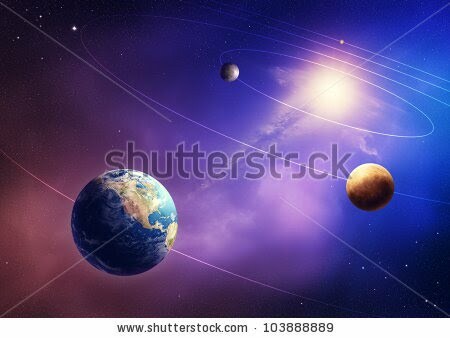 ​10) Name the largest planet in the solar system. 1) We can see a white Moon because it reflects Sun light back to us. So Moon is lit by the Sun as the other planets are. 2) The answer is Venus. At its closest, Venus is about 38 million kms from us. That does not seem very close. Does it? 3) Solar eclipse happens whenever the Moon's disk blocks the sun light from reaching a specific location on Earth. You ask a friend to point a lit torch towards you. Ask your friend to block the light with his hand. His hand is like the Moon and the torch is like the Sun during a Solar eclipse.It is definitely a new moon if you have a solar eclipse. ​4) Neptune is the farthest planet in the solar system. Pluto can be farther than Neptune but Pluto is no longer considered a planet. 5) Lunar eclipse happens when our Earth blocks the sunlight from reaching Moon. Lunar eclipses can happen only during a full moon day. 6) Venus is the brightest planet in the solar system as seen from Earth. It is visible on most days in a year either as an evening star or a morning star. Should they not have named it morning planet instead of morning star? 7) Mercury is closest to Sun. Sun light would be unbearable here since it is closest to Sun. 8) Neil Armstrong and Buzz Aldrin were the first human beings to set their foot on Moon. 9) Earth has only one known natural satellite and that is our beloved Moon. 10) Jupiter is the largest planet in our solar system. Jupiter is about 317 times more massive than our planet. This section is dedicated to young kids wanting to expand their knowledge in astronomy. It would contain easier questions about our solar system. Even adults can try these questions to see if they can get ten out of ten. This would be a fun way to learn astronomy as I have said before. If you get all the ten answers right, you should try the other pages with more difficult questions. In case if you score less, be happy that your learning process has started.